Made by hand on the potters wheel, in my studio located in the Catskill Mountains, my pots are designed to be used and enjoyed on a daily basis. In my work I strive to marry the concept of form with function, so that each individual piece is not only visually pleasing, but a joy to use as well. I make a variety of wares: platters, serving bowls, pitchers, mugs, casseroles, vases, jars, teapots, and more. All of my stoneware pieces I hand throw on the potter's wheel. This process allows for the subtle variations of shape and form that gives each pot a life of it's own. I decorate the pots with brushed white slip, sgraffito (incised drawings), brushwork ,and a variety of glazes that are poured, dripped, and brushed over the pots. The pots are then fired to a high temperature in my gas fired reduction kiln. 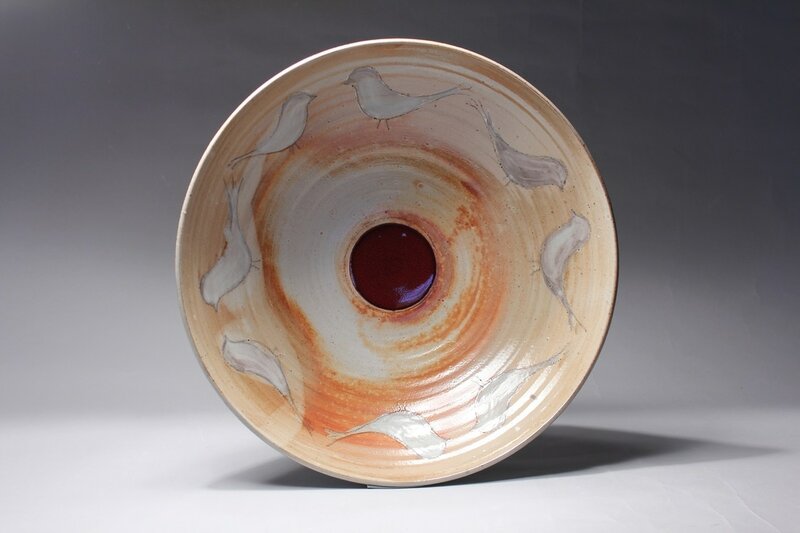 The variable flame and temperature in this firing creates a depth of color, surface texture, and variability that gives the pottery a rich added dimension. The glazes I use; ox-blood copper red, japanese shino, and volcanic ash, are designed to respond to the flame in the firing.. The end result is pottery that is lovingly crafted to marry form, function and beauty. The first time I saw a pot being formed on the potter's wheel it was magic. I was instantly fascinated, watching the malleability of the wet clay as it became a pot. Working the clay on the wheel with all of the possibilities and intuitive freedom throwing on the wheel involves continues to be a great joy to me. I also draw upon the surrounding beauty of the Catskill Mountains where my studio is located for inspiration. That combined with a love for and appreciation of traditional Japanese Pottery inspires me to create pots that are rich in quiet beauty and strength like the mountains around me.